The picture was painted by Levitan in 1899. Autumn completely changed the whole nature. All the thick summer greens were gradually washed away by the rains, the trees dressed in orange and yellow outfits. The once dense forests became translucent, completely transparent. Summer with its wild colors gave way to purple and golden autumn seasons. The artist loved this time of year. He was waiting for him with the greatest impatience and trembling. How many autumn days he transferred to his canvases. There are almost a hundred paintings dedicated to the fall, and this is not reading etudes. Each time on the canvases of the artist autumn appears in a new way. In this picture we see things quite familiar to us all from childhood. Birches are still dressed in fancy bright dresses of yellow and red leaves, the wind did not manage to blow them away. The sky is so unusual that it painfully resembles the still very thin first ice on the river. We feel how sad the days of autumn are. The leaves are crumbling, the grass is rotting, the sun is still warm, but very weak. All nature is preparing for winter. Levitan – master of color. How gorgeous the white trunks of birch trees in the background are still in some places of green grass. Paints incredibly colorful and juicy. The artist deliberately does not prescribe every blade of grass and each sheet. Before us appears a certain haze, about which the poets said that it was “ringing.” The whole image merges into certain patches of color, creating a special mood of autumn sadness and sadness. The gray sky does not animate the landscape at all. It is quite joylessly watching the whole picture of the preparation of nature for the cold. Only graceful birch trunks are a little pleasing to the eye, enlivening this dull landscape. 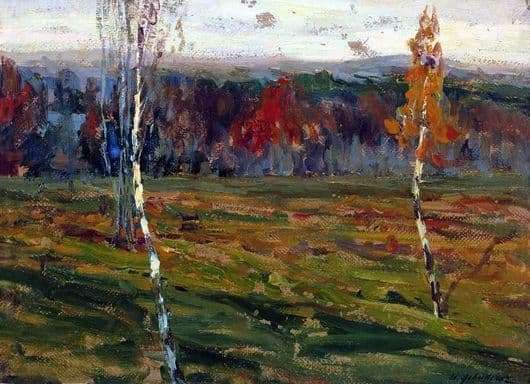 Levitan was able to find in ordinary autumn landscapes a special charm and true poetry.